the reason for almost no wine cars is that there are far fewer of them. Between barrel wagons and vans, both catalogue and specials there are probably around a hundred variants. Compared to that, beer vans run into the thousands. Here is a new addition to my wagons. It is an Electrotren all metal and wood, ostensibly catalogue #827, though I received it without a box. I love it. HO scale? If you model US stuff, there are quite a few models of US wine wagons (box cars and tankers) around. I've done a lot of work on the scenery in my wine cellar and started taking photos today. I plan to post a new photo about every week on this topic. David -- My compliments on your collection. It's well beyond exceptional!! Until happening on your thread today, I was largely unaware of the variety of vintage wine cars from makers other than Marklin. My humble collection consists mainly of Marklin's 308/1 & 4510 2-barrel wagons (shown below), plus four of their more recently made larger-barrel wagons. Thanks for the compliment Richard and apologies for not responding earlier. I haven't acquired any wine wagons for quite a while. Now and then I look on eBay to see what is on offer, but there doesn't seem to be as many as a few years ago when I was very active in building up my collection. I don't know if others have noticed a decline, especially in the rarer wine wagons being advertised. I have looked through all the 2015 Marklin online catalogs and it appears that the only wine wagon Marklin introduced in 2015 was a wine barrel car included in the 46069 Freight Car set. Not good enough Marklin so please atone in 2016. Nice to see hear from you again. I was beginning to wonder if photography had totally taken over your interest. I would agree there are not that many around but that is perhaps a reflection of the fact that compared to beer vans not that many been produced. However if you keep looking you can find them. I must try and get some photos of my more recent ones posted. 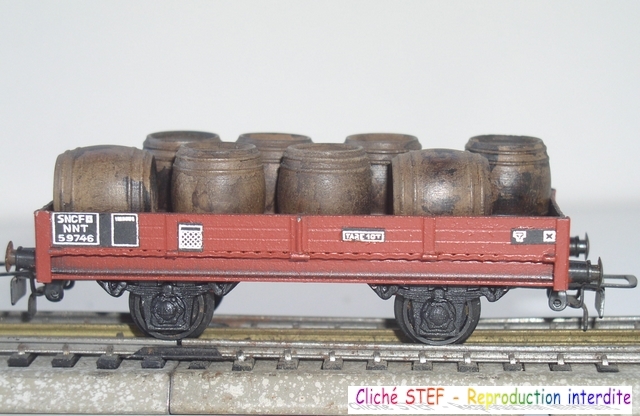 Away from Marklin, Fleischmann have an ongoing programme of producing variants of their enclosed barrel wagon with nice ones from Spain this year. 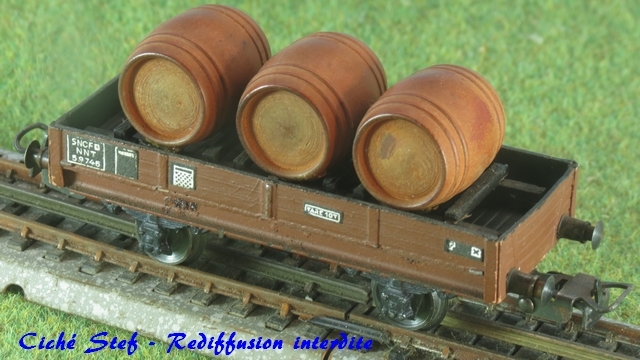 Also from Spain K*train have another couple of enclosed barrel wagons and a metal tanker. Acme, LSM and Tillig all have barrel wagons, open or enclosed. True, but have you had a look at the Koll's special catalogues? There is a 45013 set that looks nice..
Of course, the question is: Is it wine or beer in those barrels? Wine, for the production of wine vinegar. Guilty your honour, it has been a long time Bob and photography did consume my time. Now I have taken up the drums and piano. I'm a sucker for punishment. I checked Marklin's 2014 catalogue and there is a wine barrel car in the 46086 freight car set. I would like to acquire the wagon but have no interest in the other six freight cars. According to the catalogues I have, Marklin has not produced an HO scale wine wagon as a separate item for at least the past two years. I have started downloading catalogues for all the manufacturers I know going back to about 2011 and will post the model numbers on this forum topic of any wine wagons I find. I'm off to Spain in 10 days time and will be away for five weeks, so you won't hear from me during that time. If anyone is interested in photography, I'm only an enthusiast amateur who has bought more stuff than I can use. I set up a website www.dtpixter.com using a template from www.Wix.com. Happy to chat with anyone on photography via the contact email address on the website. Can you guess the location where the photo was taken (of me by my wife) on the home page? Hint, it is somewhere in the UK. Cheers from downunder Bob and I didn't mention the Rugby World Cup 2015 in respect of the readers whose country got knocked out. That wouldn't be Australian! I don't know why I say Vale of Evesham, because I have never been there. But I must admit to having read most of Thomas Hardy's books, and some of his poetry. The only other Marklin wine wagon that is currently available is the Michel Labatut bi-foudre which is an exclusive for France. As you said you will be five weeks in Spain that should be long enough to order one. Enjoy your time there anyway. I shall not say anything about the rugby though the speed at which the referee left the pitch might be construed as significant. The only other Marklin wine wagon that is currently available is the Michel Labatut bi-foudre which is an exclusive for France. Well, France, Italy, and Switzerland, released early 2014. I certainly got mine from Italy. See post 199 in this thread for a picture of it. I have posted a selection of photos of some of my more recent purchases on the Marklin Users facebook page. I see you have this wagon from the Wine-making school (Weinbauschule) in Weinsberg. This wagon was designed by Hans Bender (my favourite Märklin dealer for the last 20 years, based in Weinsberg). Actually its reference number is 4482.047, not as you have it. I have a complete collection of all the many wagons designed by Hans (most of them not wine-related). Have you seen or collected the ones below? This Weinbauschule one is actually my favourite Märklin special-edition wagon. and this was the original Wodka Gorbatschow wagon, before Märklin themselves copied the idea and issued the 44530. Collecting wine wagons is a nice idea, and you have a great collection! Hans is still my Märklin dealer, and my source of all support and information. He's a really good man. It's now 25 years he's been my dealer, and I presented him with a commemorative silver plate when Chris and I visited him at the end of May (after we'd been to Zuffenhausen to collect my new car)! Are you coming to Eurospoor or Cologne this year? A link for a few wine barrel coaches from the Bavarian Länderbahn. So many cart loads wine wagons, an so little wine. I have this wagon, it is a Trix Car Club (2012). Really nice. Sorry I did not respond earlier but I took a long break from this forum. 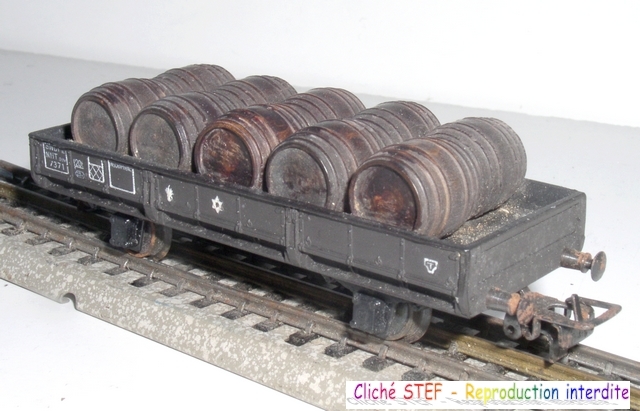 However, I did buy a number of rare HO scale wine wagons from a French collector between April 2016 - Feb 2018. Manufacturers included Marklin, Roco, Au Pullman, SMCF, Rateau Annees, Paul Soulleys, Ibertren, VB, JL Jean Laffont and Sachsenmodelle. Happy to provide photos to anyone who is interested. Nice to hear from you again. I did wonder about what had happened to you. More photos would be welcome..
Was the French collector Didierbetty who is still listing on E-bay? I purchased quite a few items from her. I suspect it may be an estate collection that is being sold off. Nice to chat with you again. You are correct but Didier was a male last time I communicated with him (Sep 2017). My understanding was he was selling his collection because they were taking up too much space. I have around 440 HO scale wine wagons in my wine cellar but Didier's collection leaves me in the shade. I cannot fathom how long it took him to collect them (HO, O, N, Echelle 1). I will post photos of all the wagons I purchased from him (it will take some time) starting with Paul Soulleys whom I had never heard of. Merry Xmas from Australia and we finally won a game of cricket (against India). Aside, have you noticed how much more expensive it is to post wagons from Europe and the US? Attached below are photos of 6 (of 17) HO Scale Paul Soulleys wine wagons that I purchased in 2017. They are all rare. I have Googled his name without much success. Luv to hear from anyone who knows something about him. I will post photos of the remaining 11 wagons over the next couple of weeks. I assumed female from the Betty part of the name. I guess that is just the French. His catalogue is fascinating and well worth perusing as a record of what has been produced even if you do not buy from him. I would guess I have around 100 wine wagons along with a lot of others. However space is now at a premium so I am having to be fairly selective about what I buy. I did avoid going after older items to avoid problems with wheels. If you are looking for something new look out for Omnibus Models from Spain. A new firm that did some unusual metal bi-foudres. They should still be available, try Bazar Matey. Merry Christmas from a rather dull but not too cold Scotland on the Winter solstice. I shall be running a suitable train for the season. 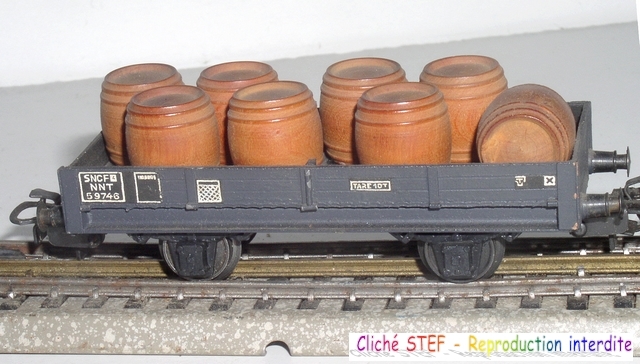 Photo below is a very rare VB HO scale wine wagon 24cm long and by far longer than any other in my collection. Is there a longer one? My thought was too: why such a long wine car. We trink it, before we transport it. So we only need short wagons like the one in this train. See the wagon with the name CASTELL on it. A small wine village, not far away from my home. Photos below are of two very rare Au Pelican wine wagons produced between 1940-1950. Does this mean you need to drink your way round the mainline? I have drank my way around the mainline too many times to count. Some of my most interesting eBay purchases were made after a couple of glasses of wine too many. One purchase mistook a Z class wine wagon for an HO scale. You will never see a smaller model train wine wagon. Let me add to your education on Vollon & Brown (VB) which is one of the most collectable brands around and produced model trains in the 50s & 60s. In 1946, Jacques-Antoine VOLLON and Albert BRUN team up to create the VB brand setting up their establishment in Paris. 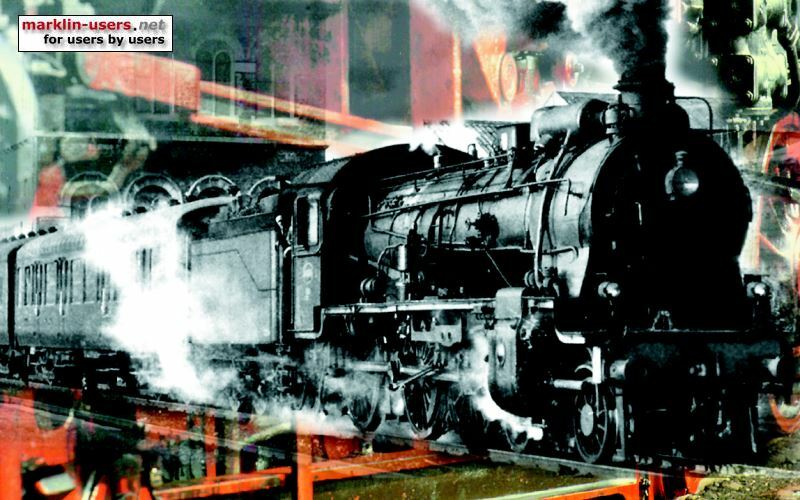 In 1947, commercialization of freight wagons of an excellent finish for the time. In 1960, the market underwent a significant change and VB had to face a competition that knew how to adapt to the requirements of the market; thus JOUEF offers products at lower costs and captures VB customers. At the end of 1960, LINES-BROS bought VB. I have posted below photos of 5 VB wine wagons from my collection. Thanks for the photos of some nice looking wagons. To expand on your remarks about the take over of VB by Lines Bros. This was an ultimately unsuccessful attempt to expand the Tri-ang range into the French market. Most of the VB range was deleted and only a few items were produced However it coincided with the rise of the low cost brand Jouef which was to sweep away all the traditional French makes. With the failure of Meccano Ltd. in 1964, Hornby AcHo was also to fall into the Lines group but it too vanished fairly rapidly. Ironically after various changes of ownership for both brands, Jouef along with Electrotren, Rivarossi and Arnold, is now part of Hornby Hobbies, successor company to Tri-ang. Sadly these ranges are only shadows of there former selves. There was a web-site which listed all the French companies but I think it is no longer active. Below are three links below which record the history of VB. What amazes me is that this Marklin forum is tolerant of non-Marklin discussions. I have around 103 HO scale Marklin wine wagons which accounts for almost 25& of my collection. Aside, I have HO scale model wine wagons fron 35 manufacturers and am more than wiling to share photos and information with anyone who is interested. Yes, there is a company named HORNBY today. But that company has nothing to do with MECCANO LTD which was the the inventor and producer of HORNBY DUBLO and the "old" HORNBY-trains. When LINES BROS took over MECCANO 1965 the tools for the original HORNBY - trains (but not the name) were sold to G&R WRENN in 1965. LINES BROS replaced the HORNBY-trains with their own TRIANG- trains and named the TRIANG-trains "HORNBY TRIANG" until they broke down in 1971. While MECCANO (the construction kits and other toys) was sold to AIRFIX (which went in bankruptcy in 1979), the HORNBY TRIANG trains were sold to DUNBEE-COMBEX-MARX which sold the trains as HORNBY until they went into bankruptcy in 1980. Between 1980 and 1986 there was no company producing HORNBY - trains or using the name. The "new" HORNBY was founded in 1986 and used tools bought from the DUNBEE-COMBEX-MARX remnants. The name HORNBY was adopted for the model company as it was vacant while after the various changes while there was still a separate company trading as Tr-ang. A full history of Tri-ang-Hornby 1950-1995 can be found in the three volumes by Pat Hammond. Unfortunately a proposed forth volume failed to appear after the publishers New Cavendish Books had financial difficulties. Ramsey's Model Trains contained useful product lists but it too appears to have ceased publication after the2016 edition. I have been away for a while and am happily back amongst freinds! "What amazes me is that this Marklin forum is tolerant of non-Marklin discussions." I suppose that Mother M made many versions of the 308/4510/2760, but How Many? Is that a "Kohl's Catalog" thing? Thanks for the wonderful pictures, in particular from electrotren wagons. Living in the Spanish "Penedes" wine region most of the advertised companies are familar to me and the wagon from "Reus" is a nice sight. Guess you already know it but Matey, or I better say Bazar Matey is an old and well renewed train shop from Madrid. Here´s a pic of the beautiful old shop located at Fuencarral Street. A few years ago they moved to a street near Fuencarral and the shop lost quite a bit of its half-century charm.